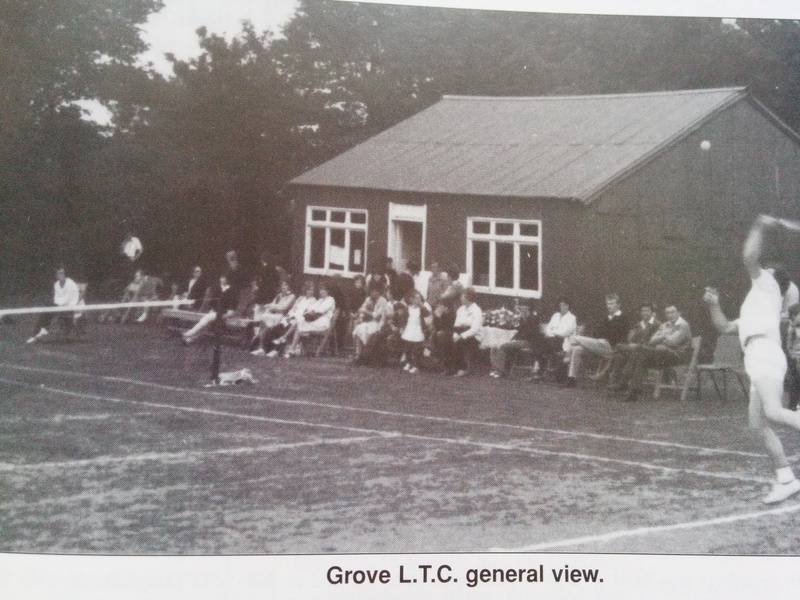 Although the Grove Lawn Tennis Club opened in 1959, its origins are linked to two earlier tennis clubs in Malahide, Dublin, both of which are no longer in existence. These were the Castle Lawn Tennis Club and the Malahide Junior Lawn Tennis Club. All three came into being because of the restrictions on membership of Malahide Lawn Tennis and Croquet Club. Towards the end of 1958 the founder of Malahide Junior Lawn Tennis Club, Kitty Hodges, decided to retire and on her retirement the club would cease to exist. She was concerned that the children she had trained would have nowhere to play. She approached Mr Eoghan Kavanagh who arranged a meeting in Malahide Library on Monday 16th February 1959. 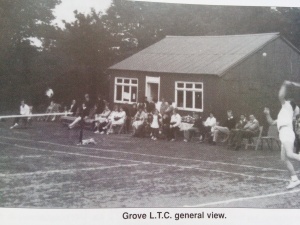 This meeting was to be the inaugural meeting of the Grove LTC. Each person present contributed £1 towards a fund for initial expenses. Mr Leo Fogarty was elected Chairman. A difficult and extensive search for a site then followed. Mr Pat Howard, who was at that time planning a building development at the present Grove Avenue, agreed to set aside a portion of his field for the club’s use. The club is indebted to the Howard family for this. On the 8th April 1959 development work commenced. Tom O’Sullivan, Mr Howard’s architect discovered that Aer Lingus had a building which was no longer needed and he acquired this for the club. This club house still remains. After the completion of the pavilion, an official opening was held on 3rd May 1959 with P.J. (The Bishop) Burke T.D. and other dignitaries attending. At this time mothers took it in turns to supervise the children, bringing a chair to the club each day to sit on. The courts were only open from 2 to 6pm for the months June to September. The first parents section was also formed around this time. The club thrived until about 1968, where at the AGM on 10th April, the chairman Des O’Reilly, commented on the rapid decrease in membership, the lack of interest on the part of parents and the impossibility of obtaining toilet facilities. He suggested that the in-coming committee seriously discuss the possibility of closing the club. The topic of toilet facilities recurs throughout the minute books, it was to take about 20 years more before they were installed! At the AGM of 1970 it was reported that the club was going through a difficult period. Social and tennis functions had not been well attended during the 1969 season and subs had fallen. It was decided to call an EGM and at this meeting it was proposed to close the club down. A counter proposal, that the club should continue was put to the meeting and this proposal was carried. The greatest problem facing the club now was how to attract new members. The decade 1970 – 1980 was a very busy one in the club’s history with improvements to the grounds being made. In 1974 Mrs Kitty Hodges was made an honorary life member in recognition of her role in promoting junior tennis in Malahide. It is noted in the minutes that Mrs Hodges died in 1978. The Grove LTC is in her everlasting debt. Over the years there had been periods of worry regarding the club’s position on the Grove Avenue site. In 1985, Michael Howard, a nephew of the original landlord agreed to sell the site to the club. By 1986 all details in connection with the purchase of the freehold were completed. 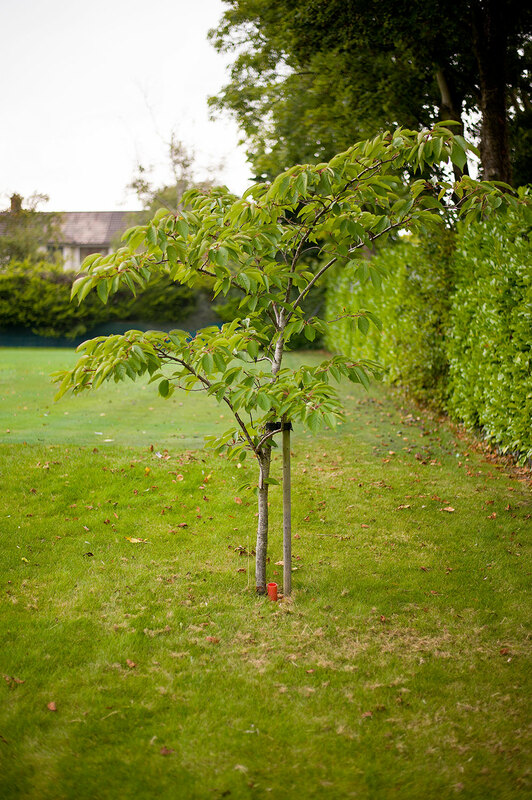 A Cherry Tree planted for 50th Anniversary of Grove Lawn Tennis Club. 2009 was a momentous year as the Club re-opened on 3rd May exactly 50 years to the day after it first opened in 1959. A flowering cherry tree was planted by the gate to commemorate the day.